The DRAG is the only "Off the Rack" professional two piece Drag Racing suit designed for maximum comfort and flexibility without sacrificing safety. This off the rack suit is constructed of a single layer of 1.4mm competition weight cowhide. All the zippers and hardware are long lasting brass. The Hybrid - FIRE is completely different from our previous off-the-rack racing suits. More streamlined in look and feel on the rider, this new generation of racing suit is constructed of industry standard 1.1 to 1.3 mm cowhide, and features Vanson's patented ventilation and armor systems. The Hybrid - BLACK and WHITE FIRENZE is completely different from our previous off-the-rack racing suits. More streamlined in look and feel on the rider, this new generation of racing suit is constructed of industry standard 1.1 to 1.3 mm cowhide, and features Vanson's patented ventilation and armor systems. Originally designed as an "off the rack" professional two piece Drag Racing suit, the DRAG is also at home as a Flat Track suit. 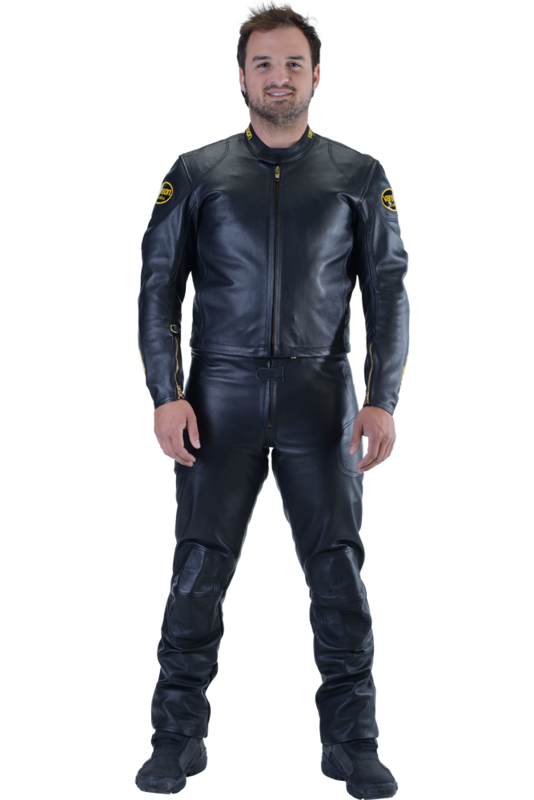 This off the rack suit is constructed of a single layer of 1.4mm competition weight cowhide. All the zippers and hardware are long lasting brass.